For many years it was the conventional wisdom to search for best value in what some called ‘Low Cost Countries’; but at the end of the day – the cost savings didn’t always come home! It was hard to find the right partner; it was hard to get them up and running. And it was hard to work the daily cadences, especially when they are several time zones apart, sometimes different languages, and not always the same sense of urgency that we are used to in Aerospace. Partnership problems aside, in the end the value expected just never really materialized. Companies started looking to bring the products back to a local vendor – one they could trust and build a good relationship with – they even started pulling out of their own factories as close as Mexico! But everyone still must find that needed ‘value’. This is why Essner is focusing on a certain niche – an area in high demand, yet not well executed by most. This way, we will do one type of product, and do it WELL! Here’s where the Essner Transformation is zoning in on. Being located in the heart of Aerospace, right here in Dallas/Fort Worth area, we have the capability of working with any American time zone easily. Being Aerospace Fabrication and Supply Chain veterans, we understand intimately the importance of a trusting relationship, and reliable performance. So we are setting up our Production System to accomplish those very things. And as far as providing value, we will focus on the smaller items that the OEM’s and Tier One’s don’t want to mess with, and we will put the best technology and the most efficient Production System (the Theory of Constraints multiplied by Lean) to task on it – to reduce flow time and therefore cost to our customers. These ‘smaller items’ include simple benchtop assemblies that a typical LCC might be looked at for, and all the sheet metal and machined parts that support them. Generally in the 1 cubic meter sized range for machined parts, and almost any sheet metal part. For machined parts, our highly efficient Okuma Machining cell is complemented with integrated probing that can inspect the parts before they’re done, and then de-burr them right off the machine. And for sheet metal, our tightly aligned sheet metal services are designed to shear, form, and process a part from start to finish within 5-7 days. Most importantly, we have 3 of the 4 most utilized NADCAP approved processing capabilities right here under our own roof – with the fourth one planned to be in operation soon! No more expedite fees or 2 week lead times for anodize, or prime/paint. All this value enhancement within the Production System affords us to be able to keep ~1 months stock on hand as a strategic buffer stock that protects our customers from any of the variation that may happen within the line. If a machine goes down, or there’s significant absence, or weather problems, or whatever, our customer should never feel that pain – we can support with the strategic buffer stock that keeps you supplied while we recover. Think of us as a small “Mom and Pop” shop but one that is highly efficient– your local Low Cost Country Partner! One who’s goal is to provide you with top quality parts with unbeatable service you expect, at the value you need. 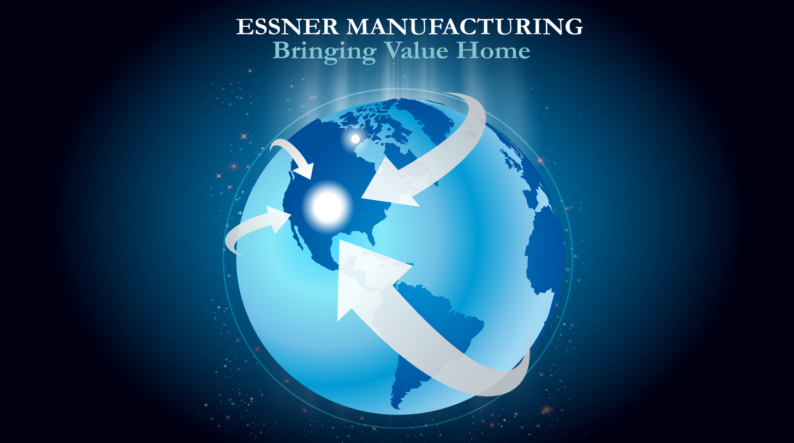 At Essner, We Are Striving to Build a Superior Work and Customer – Focused Culture.